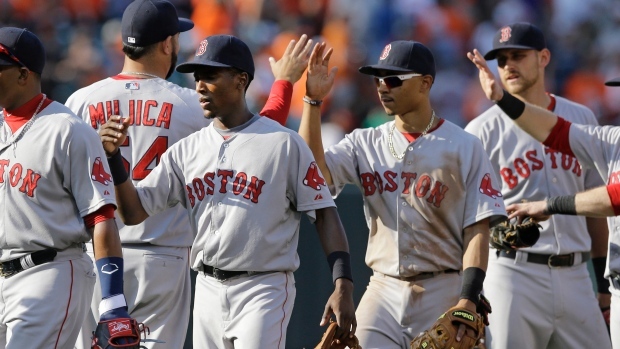 BALTIMORE - As this horrid season draws to a merciful conclusion for the last-place Boston Red Sox, every once in a while there is cause for optimism. Boston's performance Sunday in a 3-2 win over the Baltimore Orioles provided manager John Farrell with no small measure of encouragement. Joe Kelly pitched seven innings of three-hit ball and the Red Sox used home runs by Mookie Betts and David Ross to beat the AL East champions. "With the amount of turnover that we've had and the new players we've added, there's always been good energy each day we take the field," Farrell said. "It hasn't always worked out with the bottom line score, but our guys love to compete." Some of them are playing for their jobs, because there's no way this team returns intact in 2015. "There are a number of guys here that know there's a lot of evaluation going on as we go into the off-season for decisions that will take place before opening day next year," Farrell said. "We've got youth, we've got energy, there's athletic ability, and they know there's something at stake individually." Kelly (3-2) gave up two runs, walked three and struck out five in his fifth successive outing of at least six innings. It was his ninth start for Boston since being traded to St. Louis in the July 31 deal that sent John Lackey to the Cardinals. "He continues to bring very good stuff to the mound," Farrell said. "I feel I'm throwing the ball decent," Kelly said. "I don't know what my numbers say before, but I'm happy right now with my fastball command. It's something that has been a lot better since I've been over here. Finishing down the stretch, the command of my fastball feels good, which is usually key for my success." Edward Mujica got three outs for his eighth save. Boston took two of three from the Orioles, who have been playing without several regulars in the lineup since clinching the division crown on Tuesday. Baltimore still has a chance to catch the Los Angeles Angels for home-field advantage throughout the post-season, but manager Buck Showalter's priority is keeping his team fresh and sharp for October. Centre fielder Adam Jones didn't start, and Nick Markakis and Steve Pearce were held out with minor injuries. That's the benefit of clinching early. "It's allowed us to do a lot of things we normally wouldn't be able to do," Showalter said. "We're trying to keep our priorities in order here, and that's getting Steve back and getting Adam rested up some and getting Nicky back and getting our bullpen as good as they can be." The Orioles finished 50-31 at home, 31-10 since June 29. They did not lose successive games at Camden Yards after June 28-29. Miguel Gonzalez (9-9) allowed three runs and eight hits in 5 2-3 innings, his first start since Aug. 2 in which he failed to last six innings. Betts hit his first career leadoff home run, ending a run of 67 at-bats without going deep, to give Boston the early lead. A two-out RBI single by Yoenis Cespedes put Boston up 2-0 in the fifth. After Ross chased Gonzalez with a sixth-inning solo shot, Baltimore answered with two runs in the bottom half. David Lough hit an RBI double and Nelson Cruz drove in a run with a groundout. It was the 106th RBI of the season for Cruz, who was chosen Most Valuable Oriole before the game in balloting by the Baltimore media. Red Sox: SS Xander Bogaerts left in the second inning with neck stiffness and was replaced by former Orioles infielder Jemile Weeks. Orioles: Markakis (shoulder) sat out a fourth straight game and Pearce (wrist) missed his second in a row. Showalter was not concerned about either's availability for the post-season. "Not at this point," the manager said. Red Sox: Boston has Monday off before opening a three-game series against Tampa Bay, the start of a season-ending homestand that includes three games against the Yankees. Orioles: LHP Wei-Yin Chen (16-4, 3.58 ERA) starts for Baltimore in the opener of a four-game series against the Yankees.